Silver Prices - Silver Prices - Minco Silver: Up Over 100% in 4 Months! We don't often invest in junior exploration stocks, as we prefer to stay with companies that actually have some silver and are therefore leveraged to the silver price, as opposed to exploration companies that may or may not ever find a single ounce. However we made and exception with this one and bought Minco Silver back on April 24th 2007 and despite it being a rough ride, we are now holding the stock at a paper profit of 25%. Minco Silver has a silver project in China called the Fuwan project, which they have been working on over this past year with some interesting results. At at market cap of around $109 million, a rough estimate tells us that Minco is trading for 76 cents per ounce of silver, using indicated and inferred, and at $1.50 using only the indicated resource. This is a cheap valuation in our opinion, but there are a lot of factors to consider. For example the resource is not yet a NI 43-101 certified resource and so there is the issue about whether the silver is actually there, plus whether the company has the ability to mine the project profitably. However we feel the company represents good value for money at present levels. Now to whether the project is viable to mine. SRK Consulting has completed an independent Preliminary Economic Assessment (PEA) on the Fuwan silver deposit and the results suggest that this project could indeed be mined. The Fuwan project is viable as an underground mining operation and by processing 2,500 tonnes per day, Minco could mine 4.9 million ounces of silver. This would be done at a cash cost of US$2.40 per ounce and Fuwan would have a 12 year mine life. As investors who are bullish on silver, we are looking for leverage to rising silver prices and this project will offer exactly that. Using a silver price of $12.11 per ounce, this project pays back the $57 million pre-production capital cost in just 1.7 years. A glance at the live silver chart screen in the office show us that silver is currently traded at $16.65 in Hong Kong, so this pay back period should be even shorter as higher prices hold up. Where the real money will kick in is when the Fuwan project is in production in a few years to come. By then we think silver price will be way past $20/ounce, probably closer to $50 and Minco Silver will make a great deal of money from Fuwan. This of course will increase demand for their stock, pushing up the share price and the value of our initial investment. Due to the recent boom in commodities, hundreds of exploration companies have been formed and therefore there is a strain on the resources exploration companies need, such as drills. Therefore it is good to know that Minco is currently operating 8 drill rigs on their property, meaning they can get on with developing Fuwan. Minco has already begun the permitting process for Fuwan and will begin an international Feasibility Study on the project during the second quarter of 2008. In addtion to this, the construction and development work is scheduled to begin during the second half of 2008. Aside from the main Fuwan project, during this coming year Minco intends to begin a 15,000 metre drill program along the Fuwan Silver Belt, another area close to the Fuwan deposit where soil samples have shown evidence of silver. 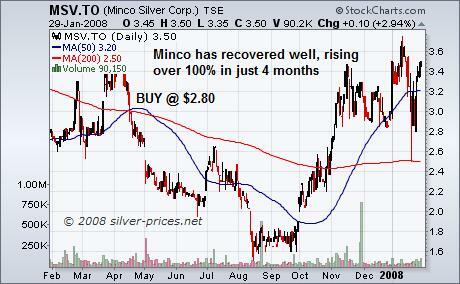 We are comfortable with our position in Minco Silver at the moment. It has been a rough ride, with our investment showing a paper loss of 37.5% at one point, however we held our nerve and have never sold a single share. Our confidence in the fundamentals has paid off, with our purchase now showing a paper profit of 25%. We are in for the long run on this one, so if you think you can handle the ups and downs of this roller-coaster ride and hold for the long term, then you may wish to pick up some Minco shares. Don't be disappointed if this stock doesn't move up and down with every tick of the silver price. The main movements in the stock will be as the project develops into production, but once its in production it will an excellent vehicle to provide leverage to the silver price. Stay updated on the silver market and silver stocks by subscribing to The Silver Prices Newsletter absolutely FREE, just click here and enter your email address to subscribe. Minco looks like an excellent looking long term play. Also, take a look at my review of Shoshone Silver Mining company as well.